A non-league manager is in hospital after suffering a freak injury while celebrating his team winning the Western League First Division. "In the changing room my assistant said Welton had drawn and we'd secured the league, so we all sprung off the benches chanting. "As I'm jumping up and down I felt a pop in the back of my Achilles and thought 'what have I done here?" England physio Gary Lewin was sent home from the 2014 World Cup after dislocating his ankle while celebrating a goal. Ex-Manchester United goalkeeper Alex Stepney once shouted so violently at his defenders that he broke his jaw. Another former England keeper, Dave Beasant, severed a tendon in his foot trying to trap a falling jar of salad cream. Ex-England cricketer Derek Pringle suffered a back injury writing a letter. Former England midfielder David Batty damaged his Achilles tendon tripping over his son's tricycle. Wolves goalkeeper Carl Ikeme broke his hand punching a dressing-room tactics board. Yeo, 35, has had surgery and believes he will not be able to run for at least six months. 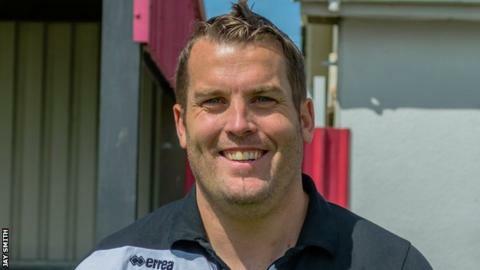 The injury meant he had to miss Barnstaple's 1-0 victory at Almondsbury UWE on Tuesday. "I'm not going to lie, if it was someone else I'd be laughing and joking with the rest of them," added Yeo. "I actually didn't go up to the hospital until Monday. Now I'm here drugged up with my leg in plaster. "The amount of stick given to me has been incredible, but it's all good fun." Town will finish on 100 points if they win their final league game and can complete a double if they win the Les Phillips Cup final on 10 May. "I'll be at the presentation on Saturday, there's no doubt about that," Yeo added.